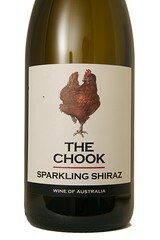 Uniquely Australian, The Chook Sparkling Shiraz reflects the true intensity of colour and fruit characteristics for which Australian-made Sparkling Shiraz is being enjoyed throughout the world. This wine is a full bodied offering which combines the attributes of fruit with tannin, sweetnesss and bubbles to deliver rich concentrated flavours and a full and rewarding palate. I'm sure you'll enjoy it as a special occasion wine just as much as we like to tell chook stories.